Oskars is the best accommodation we have enjoyed anywhere that we have stayed in Greece and we have visited many times and places in your lovely country. We came to kefalonia for the first time in may 2004 and fell in love with both the island and oskars. We cannot get to kefalonia directly from Ireland anymore so we flew from Ireland to Zante and then to Kefalonia to see our friends at oskars where we had a wonderful time. This year is my forty fourth time to kefalonia having finally decided to live here at oskars studios for the foreseable future. The studios are located in a fantastic location, elevated to give a wonderful view from the balcony of the ionion sea and more. This family business provides so much more than a place to sleep and nothing is too much trouble. The accommodation is far more superior to others that i have stayed at, before they were built. The welcome you receive is more like that of a long lost relative and remains so for the duration of your stay and future holidays here. The complex provides a high quality restaurant producing greek cuisine to suit all tastes,fresh home grown produce such as fruit, vegatables and herbs enhances the flavours. The restaurant is regarded as the best on the island. 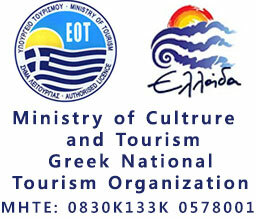 Entertainment is provided three times a week a week with greek nights,local dancers wear local and mainland costumes, tourist have a rare sight of ancient events such as the fire dance and is the only place which provides it, which is free. This large complex is surrounded with many fruit trees, flowers, plants and lawned gardens, it provides such a perfect place with an abundance of colours. Sunset is spectacular. This is the perfect place to stay and enjoy your holiday on kefalonia, close to places of interest and local beaches. Those considering a holiday on this beautiful island should not hesitate to book accommodation direct with this family business. Advice to every tourist from the young man (only for a joke) 65 years old. For more information the telephone for the bus station is: (0030) 26710 22281 – (0030) 26710 22276, or visit there office in Argostoli. Have just arrived in Kefalonia and was recommended to Oskars apartment studios. I was greeted by a warm welcome from Rosa and her son Makis, to a very clean and well kitted out apartment. The views from my room are out of this world, and tonight I look forward to dining in Oskars restaurant. Well worth the walk,first try of greek food which was excellent recommend the rabbit!Stunning views and sunset with friendly helpful staff.Got to sample the Greek night it was brilliant with the fire and dancing on the table.A Good all round entertainment for all families. Very good night out at Oskars we had a wonderful time,especially the fire on the feet!Oskars you are fab! We enjoyed dancing.The food and service was great,very friendly atmosphere which leaves you with very happy memories of a fantastic night out. Highly recommended by our relatives to visit Oskars complex and have a great night out.Highly worth the walk,lovely views.The friendly service and food was wonderful.Thank you. A happy atmosphere with lots of entertainment and diner participation.Well worth adding to your list of things to give happiest memories of time in Kefalonia. The food is amazing-lamb ala oskars is to die for! !.You should try it! Service and entertainment also excellent. We don’t want to go home tomorrow!